At a width of just 25 feet total, Exchange Alley is the thinnest street in Manhattan that is open to vehicular traffic. 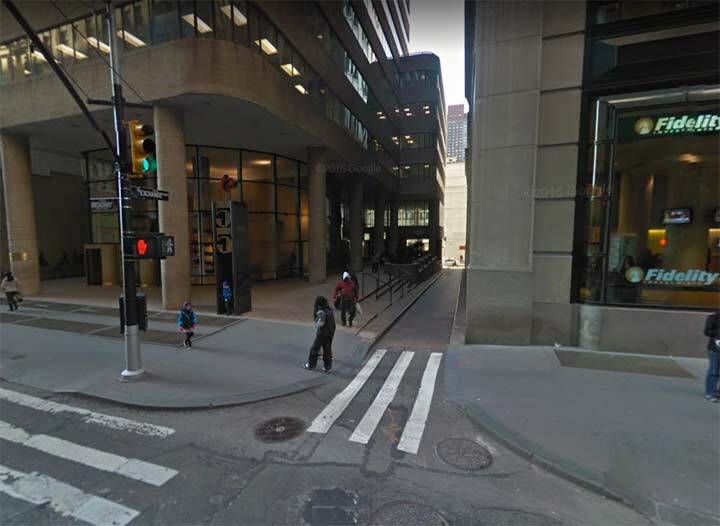 It runs one block between Broadway and Trinity Place (above), and appears as a thin crack between #61 Broadway, the former Adams Exchange Building (constructed from 1912-1914, left) and One Exchange Plaza, a brick and glass tower built from 1982-1984. Trinity Place was one of the first streets laid out in Lower Manhattan beyond the city wall and was originally called Lumber Street until it was renamed in 1846. 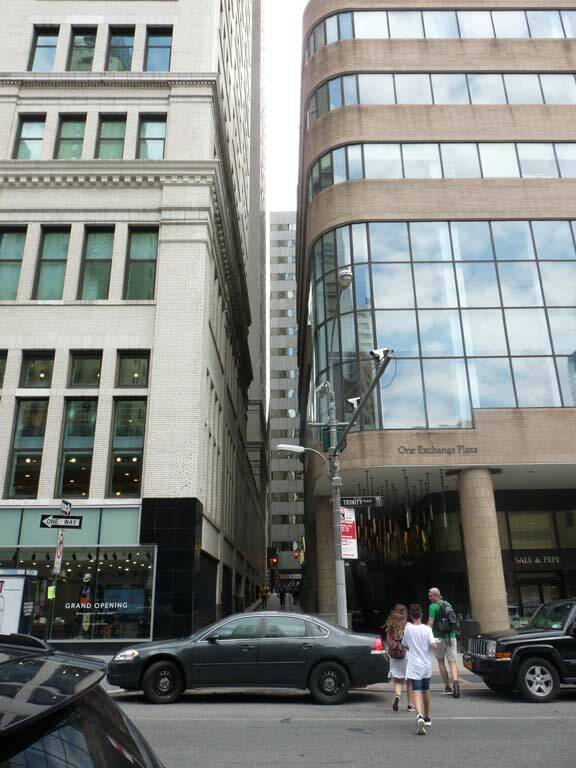 The narrowness of Exchange Alley is clearly visible here at its intersection with Broadway. Oysters, in beds in the surrounding rivers and bays of Manhattan and Long Islands, were a prime means of sustenance for the Lenape Indians and then New York City residents for decades after independence. While the British controlled NYC, this was also the case and a common British delicacy is the “pasty,” an empañada-like treat that featured a pastry crust with various meat, cheese or vegetable filling. Thus, “pasties” were consumed by the tonnage in the Manhattan of that era. However, the alley wasn’t directly named for the food. Battery Park has been remodeled and reconfigured a great deal over the past decade, and several of its historic treasures that were scattered around the park unbeknownst to even me have resurfaced, as Parks has arrayed them along State Street and Battery Place. Among them is this British cannon dug up during building construction at Exchange Alley and Broadway in 1892. 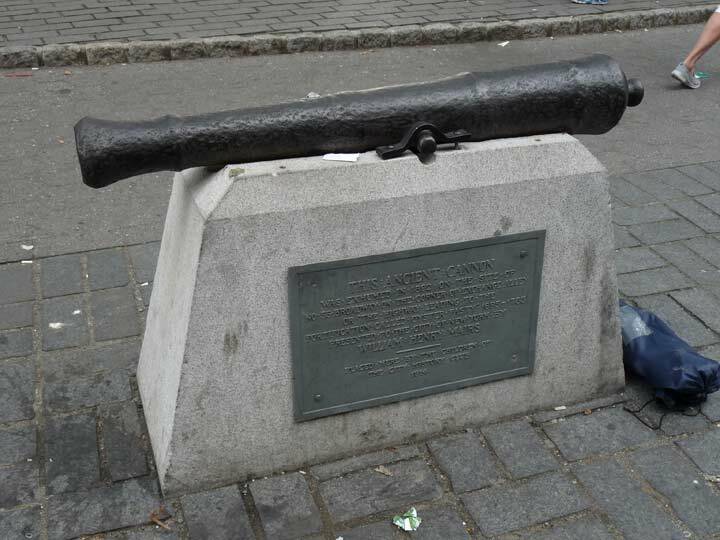 It was placed in Battery Park with a plaque by William Henry Mairs and the City History Club in 1914. The plaque explains that Exchange Alley had been used as the path to British fortifications informally known as “the oyster pasty” likely because of its shape (my guess) and thus, must have acquired the name Oyster Pasty Lane or Oyster Pasty Alley. In the 1800s, both Garden Street and Oyster Pasty Alley became Exchange Place and Alley; I don’t know the exact dates. Place names tend to get homogenized over time, and NYC has lost place names like Gun Factory Road and Skunks Misery Road (both Staten Island) and Blackstump Road (Queens). I wish we could get these great old names back. Robertson Davies’s fictional curmudgeon, Samuel Marchbanks, edited a fictional newspaper called the Skunk’s Misery Trombone. Is this really 25 feet wide? It sure looks a lot less. I believe they measured the sidewalks in the research I used. The roadbed sure looks narrower. The roadbed is about 7 and a half feet wide plus or minus. Yeah – but we still have a Force Tube Avenue.